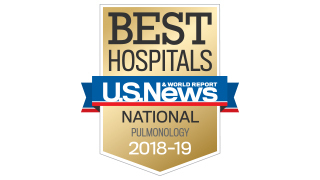 UT Southwestern Medical Center’s pulmonology program is recognized by U.S. News & World Report for 2018-19 as one of the nation’s best hospitals for treatment of lung diseases and disorders. The Pulmonary Specialty Clinic team is proud to offer a wide variety of Pulmonology services and care for our patients. Our team of physicians provide expertise in such areas as general pulmonology, hereditary hemorrhagic telangiectasia, interstitial lung disease, and interventional pulmonology. Our team of physicians, nurses, and staff is committed to helping you through any diagnosis and treatment. Patients have access to a full spectrum of expert pulmonology care. Our physicians also perform research on pulmonology disease. As a patient, you may have the opportunity to participate in one of our research studies. Complementing our expert and compassionate care is a full range of state-of-the-art resources that allow us to deliver accurate diagnostic services and successful treatments. For your first appointment, you may be scheduled for same-day testing before seeing the pulmonologist. Our scheduling staff will provide you with the appointment times and directions to all areas. We do ask that you arrive 20 minutes early for your appointment(s) to allow time for parking and registration. We do our best to see patients at their scheduled appointment time. If it's necessary to cancel your appointment, please notify the clinic at least 48 hours in advance so that we can accommodate others waiting to schedule an appointment. Patients with an appointment at the Pulmonary Specialty Clinic are asked to complete the following and bring it to their appointment.